A busy week, and apologies for lack of posting. I'm well under my once-a-day quota for March, but alas - work is hopping with exciting projects in the region. As I mentioned in a previous post, we tend to take for granted the innovative projects that come out of the Pacific Northwest. The recent National ASLA winners notwithstanding (with the exception of couple of residential examples), the PNW continues to provide stellar examples for sustainable design at a variety of scales. This does not mean that there aren't a number great projects worldwide, but sometimes as we push the envelope, we forget the fact that there are groundbreaking designs growing in our own backyards. 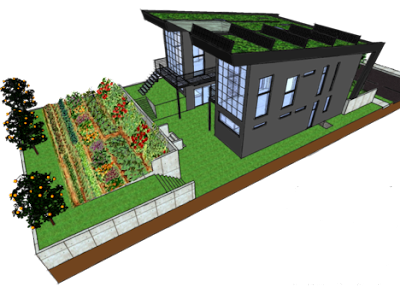 A recent small-scale project called The Commons, which is one of a number of projects that is vying to be the elusive first Living Building Challenge project. Covered in the Oregonian, as well as on Brian Libby's Portland Architecture blog - the project has also jumped out into the national spotlight via Jetson Green. Developed by a pair of brothers in Portland, Dustin and Garrett Moon and features a number of green features: green roof, composting toilet, rainwater catchement, fly-ash concrete, and most press-worthy topic by far... dirt floors. (for clarification they are earthenware - as Libby clarified after some 'backlash' about the tongue-in-cheek comment about this feature. While it's gained a lot of attention, the dirt floors are really an earthenware clay, which is an uncommon and sustainable material in typical building circles. There is a groundswell of natural builders throughout Portland with a large following - with mixed results. I liken it to the fact that whatever the material - a good designer will use it well, and the rest... well. Or, as Libby points out, there is a definite conceptual break between the DIY cob-crowd of sustainability and the flashy expensive LEED condos... "When I think of those few conservatives out there who are skeptical about green building, cob benches and dirt floors are to me precisely the kind of stuff they'll ridicule." 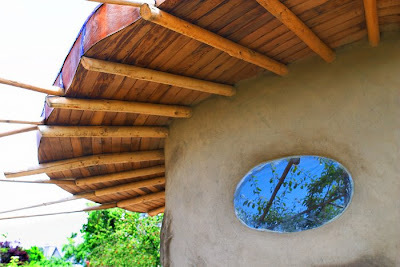 He later adds: "I just am not fond of the cob and rammed-earth aesthetic, although I certainly can't fault the function and sustainability of these age-old practices." Another local project with some sustainable features is the Portland City Storage by MulvannyG2, which caught the attention of World Architecture News: "This innovative facility will include dry storage for boats, retail spaces, offices, and amenities including a rooftop pool under a retractable roof. The project integrates an elevated pedestrian walkway providing splendid views of the Willamette River, its bridges, and downtown. Portland City Storage is targeting a USGBC LEED Gold certification and will also generate alternative electrical power thanks to a wind farm located at the top of the building." I have a more substantial post underway about some of this more site-scale wind generation appearing on a number of buildings - and it's an exciting trend to see this evolution. I think it is similar to water movement in the fact that there is a specific visual and physical connection between natural processes and the subsequent sustainable element. 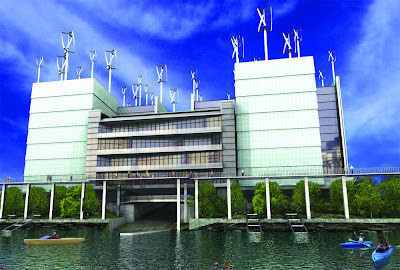 Take this a bit further, as tossed around in a project meeting earlier this week, what about taking the idea of rainwater capture and gravity flow through pipes in a building from rooftop to storage - then intervene and tap the energy generating potential by adding microturbines within pipes that could provide additional electricity generation? This brand of experimentation and techno-innovation is one of the goals of our local Green Investment Fund, which is "...a competitive grant program that awards innovative and comprehensive projects that excel at energy efficiency, on-site storwmater management, water efficiency and waste prevention." Historically providing a catalyst for experimental projects, the GIF has moved more towards leveraging and expanding the sustainable features of large-scale, well-funded projects. While I can't say anything about the quality of projects, from Mercy Corps to Park Avenue West. A good number of the projects make me scratch my head regarding the goals of the GIF. Is it to fund project sustainability and transferability, or is it to provide a little increment break for large projects? I wonder why are we dropping a chunk of cash (i.e. $100k or, over a quarter of the total GIF funds on one project) on projects that are multi-million dollar budgets to start out with, and that are really not in as much need of these funds. This is discussed as well on Portland Architecture, with Libby wondering: "Is it right that these projects, many of which seem to come from the city's biggest developers, are the ones getting a lot of the public investment from the GIF?" On the other hand, this may be the kick to make these projects a reality. 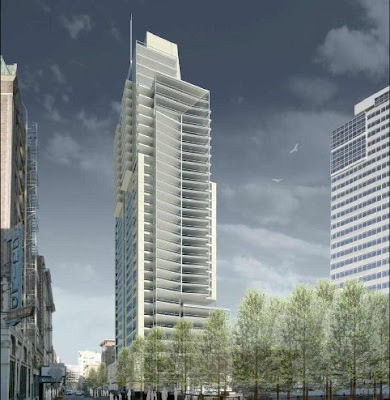 The description of One Waterfront Place, via OSD: "When completed in early 2010, One Waterfront Place will be the first speculative office building to achieve Leadership in Energy and Environmental Design (LEED(r)) Platinum certification from the U.S. Green Building Council. The 270,000 square foot building and garage built on a former brownfield will use a combination of ecoroofs, rain gardens and planters to treat stormwater on-site and restore wildlife habitat to this now-barren property. 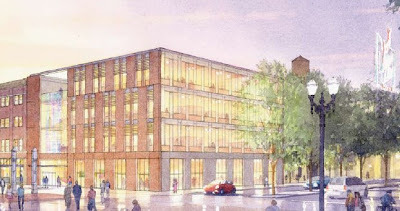 Tenants, visitors and community members will be able to view many of the building's green features, including a large solar photovoltaic system, from the Broadway Bridge and the new pedestrian bridge that will connect the Willamette Greenway to the Pearl District." It's a good project and a very good developer. They all are. But is that the point? I think One Waterfront Place and all of these projects would have happened and been plenty green without GIF funding. I personally know of a few innovative small projects that had a GIF funding or nothing element to them... these are all great projects, but when I hear grant-funding I imagine something that can provide that edge to make a vision a reality. There are a couple of smaller scale projects that recieved funding, but I'm guessing based on these previous submittals - it's going to make it less likely that innovative small-scale projects (which could provide an experimental laboratory for larger-scale projects) will even seek funding. To follow this up, I will post later this week about the Oregon ASLA award winners, which were announced at a celebration last weekend. Stay tuned for more on this. 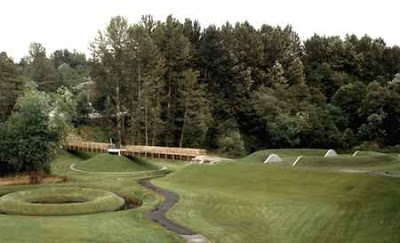 And spinning around to round this back to landscape architecture, congratulations on the announcement of landmark status for Herbert Bayer's fantastic Earthworks (via Something About Maryman). Read more about Bayer at the TLCF website. That's a big win for the good guys!